Ugh, I was feeling really good about this piece initially, but now nothing I do seems to sit well with me. I've been working on painting the background and throwing in colour, but it just seems terribly.. wrong. I think I'll take another swing at it, but I don't expect it to turn out either - I've already lost a lot of motivation, and I'm teetering on the edge of just moving on. One more shot, though! We'll see how it goes. 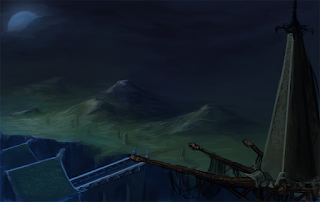 Here's the current state of the background - the tower in the front's still pretty rough, I blocked it in to see how it would work with the backdrop. I think I'll take the background in a completely different direction. This one doesn't really give the sensation I was hoping for initially, of a thief hovering over a town full of victims.